The Hong Kong dollar is the eight-most traded in the currency in the forex markets today and the third in terms of the most active currencies in Asia but isn’t a notable reserve currency despite of the facts stated above. Hong Kong is an autonomous region but is still a part of China. While its economy is small, it is free according to the Index of Economic Freedom’s standards. Services are what drives Hong Kong’s economy with 85 percent of workers involved in any kind of service. The major services employers include financial services, hospitality, retailing and trade. The region's GDP has been quite erratic for the past 20 years usually between around 5 percent and 10 percent. Inflation has shown irregular movements as well with it going as high as 10 percent around 1995 and lowering to the negative territory the time the 20th century came around. Hong Kong doesn’t have a lot when it comes to barriers to business. Couple that with the fact that Hong Kong has low taxes, it doesn’t take much to see how it has become an integral center for finance and trading in Asia. The Hong Kong dollar is overseen by the Hong Kong Monetary Authority and is not allowed to be traded freely. The currency trades within a currency band that is very tight thanks to the current exchange rate regime called a “linked exchange system”. While data such as inflation, GDP, trade balances and more are still a factor, the Hong Kong dollar has other factors that affect it. It is fixed to the U.S. dollar so whatever effects that the economic data mentioned above are minimal. 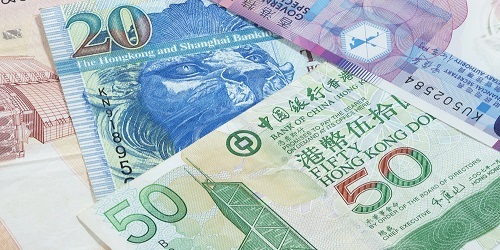 The Hong Kong dollar drives most traders away due to how miniscule price movements are but major baking institutions try to conduct trades with the assistance of computers that can capitalize on the small price movements. A lot of the transactions that use the currency are mostly for carry trading due to its low interest rates. Investors can buy Hong Kong dollars which they can use to buy bonds in countries like Australia.